Increasingly referred to as the "Manhattan of the South", Brickell is Miami's international business and banking center. 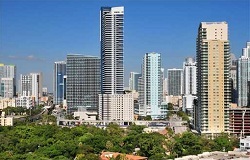 Although there are a small number of homes for sale in the Brickell area, Brickell real estate primarily consists of luxury and waterfront condos offering a unique urban lifestyle built around Marry Brickell Village. Condos for sale in Brickell range from older buildings in South Brickell to newer luxury condos that offer the ultimate in location, lifestyle and amenities. Contact us for more information about Brickell real estate. The data relating to real estate on this web site comes in part from the Internet Data Exchange program of the MLS of the Miami Association of REALTORS®, and is updated as of April 26th, 2019 at 6:24am EDT (date/time).